Not even hawks are happy about the US attack that on Saturday killed 22 people at a Kunduz, Afghanistan Doctors Without Borders (MSF) hospital. There is nothing positive to squeeze out of such an attack on a European (their name is officially Médecins Sans Frontières) aid group that is one of the less embarrassing Nobel Peace Prize recipients. The US has now changed the story of what happened multiple times. NATO, Afghanistan, the Defense Department, and the US have all pledged to look into this “mistake.” MSF wants unbiased investigators, but they’re unlikely to get them. The Kunduz hospital is closed for now, leaving North Afghanistan a tougher place. The Huffington Post reported that back in July, Afghan forces raided the hospital – whose presence was known for years to US and Afghan forces, and had been communicated to them on September 29 – and acted in a threatening manner, assaulting staff and attempting to arrest patients. This may be due to the fact that the MSF treats anyone injured, including Taliban fighters. But the presence of injured enemy soldiers does not mean a hospital is targeted for elimination under any rules of war. Is it? Why is that exactly? Is there something in the term war crime that means “as bad as Hitler’s most fanatic followers”? Baker goes on to say war crimes, if not just for Hitler, are the the domain of former Serbian president Slobodan Milosevic or Congolese warlord Joseph Kony. Those less Godwin-violating comparisons are actually tied to Baker’s tangential annoyance with college students calling Condoleezza Rice a war criminal. Clearly, Baker’s heart is truly with this idea that “Only someone blinded by moral obtuseness would draw such a comparison” between something the US did and the the attempted deliberate extermination of the Jews of Europe. The US always wins this way. Over at The Intercept, journalist Jon Schwartz has written up “A Short History of US Bombing of Civilian Facilities” in the past 25 years. If you count the death toll from a lack of pharmaceuticals in Sudan after Clinton bombed the medicine factory in 1998, that could be upwards of tens of thousands dead. If that somehow doesn’t qualify as the US’s fault, then let’s say the largest death toll listed is the 400 dead in what appeared to be the deliberate targeting of a bunker in Iraq. None of these killings, however, have the aesthetic horror of the attempt by Hitler to wipe out an entire race of people. They are a few scores of dead each. Unfortunate, but a mere blip. Plus the US has some nice qualities, and some killer founding documents. “Mistake”, or was not official policy covers a myriad of dead bodies. And it appears to cover them very securely, if the likes of Baker are any way to tell. It isn’t entirely the point if the targeting of the MSF hospital was an official war crime. Some 22 people are dead, a valuable, nonpolitical civilian installation is destroyed. MSF says they spent half an hour desperately trying to tell the US that they were bombing a hospital, to no avail. Baker is being obtuse if he thinks the point is whether the US now, or ever, sits around in a secret mountain lair laughing evilly as they plan to wipe out as many hospitals as they can. Regardless of international legality, lecturing surviving MSF colleagues about the tenure of their indignation over being bombed is vile. Plus, the hospital bombing sure seems as if it was against Pentagon policy. As the Guardian noted, the Pentagon allows for the removal of a hospital’s protected status in certain cases, but advance warning must always be given. MSF says they weren’t given any warning whatsoever. The Pentagon guidelines also demand proportionality in the attack in the case of fighters using a hospital to commit violence. This means destroying an entire hospital or bombing it into non-working status is not kosher, even if a few gun-toting fellows were hiding inside. US forces respond to the force being used and the weapons that the hospital occupiers possess. And actually, this attack may be a legal war crime if, as the MSF claims, no Taliban fighters were anywhere near the hospital when it was attacked. Afghan forces say they were, and various US sources have changed their minds and are now looking into the matter. General John Campbell, commander of US forces in Afghanistan said US forces were not in danger at the time of the attack, and would not say if Afghan forces were. According to the International Committee of the Red Cross’s definitions, “making medical or religious personnel , medical units or medical transports the object of attack” is a war crime. Furthermore, the Nazis committed not just war crimes but crimes against humanity. The latter involves “widespread or systematic” violations of agreed upon standards. Morally and legally, “if you’re less than Hitler, you’re off the hook” is not the standard – no matter how badly the US and its most ardent cheerleaders wish that were the case. 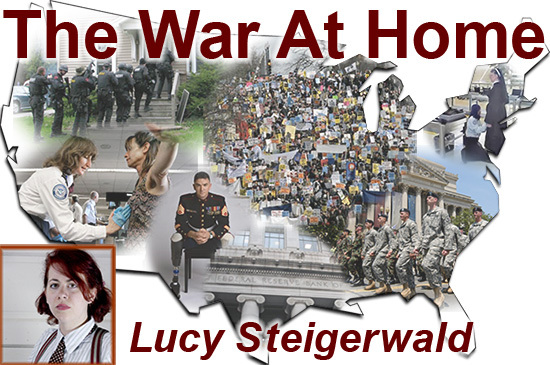 Lucy Steigerwald is a contributing editor for Antiwar.com and a columnist for VICE.com. She previously worked as an Associate Editor for Reason magazine. She is most angry about police, prisons, and wars. Steigerwald blogs at www.thestagblog.com.